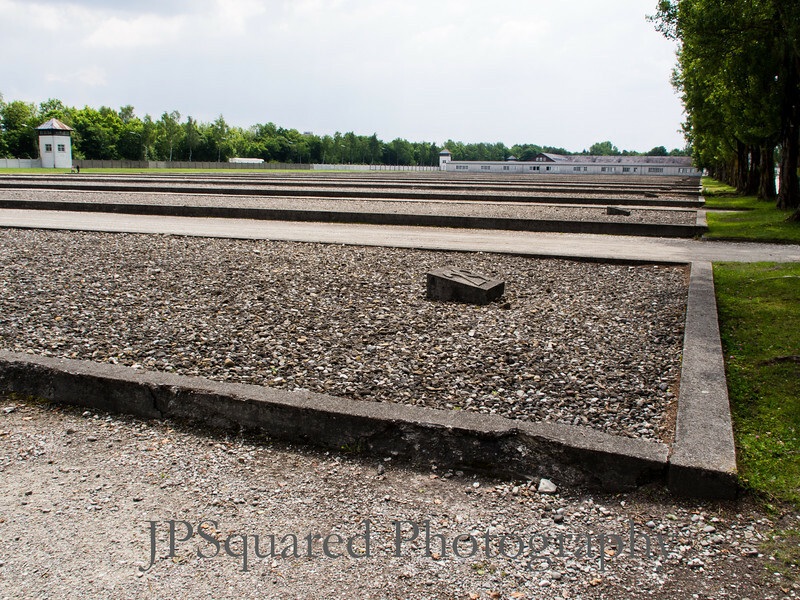 Today's post includes another couple of images from the Dachau Concentration camp outside Munich. The imprisoned workers who lived and worked in the camp lived in a series of barracks that lined a central road through the camp. There 34 barrack buildings in total, 17 on each side of the road. To bring a little humanity to the camp, the mail road was planted with poplar trees on both sides of the road and grew to a fair height before the camp was liberated. The poplars remain to this day as a living link to the prisoners who were held there. After the war all the barracks were torn down, only the foundations remain. The foundations are filled with pebbles, and a maker to show which barrack was which. Two of the barracks have been rebuilt and serve as part of the museum, showing how living conditions existed when the camp was first opened and deteriorated through the course of the camp's existence. 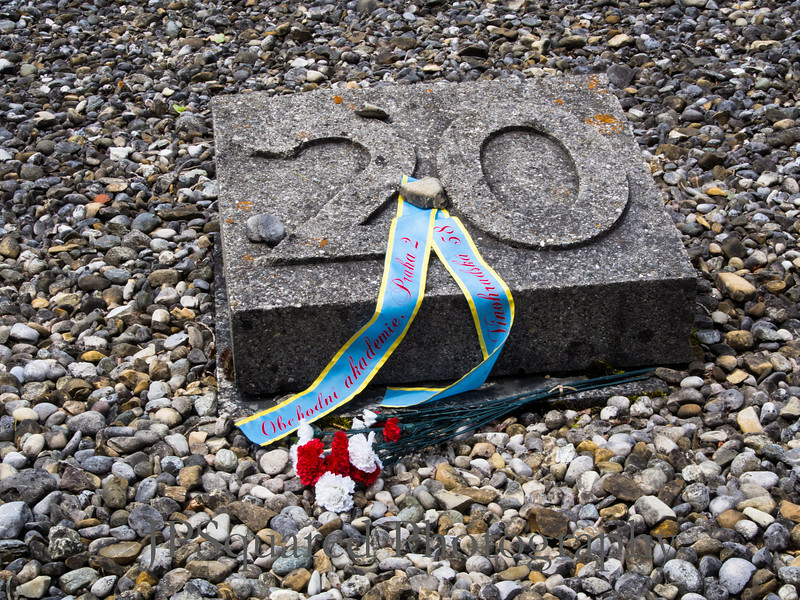 As we walked down the main camp road, in between the poplars, at one of the Barracks footprints I noticed flowers and a ribbon at one of the building markers. I took a picture of it relative to the barrack footprint and then got closer to capture the ribbon itself. The ribbon was left as a memorial, one that has turned into a bit of a historical research to understand the story behind the ribbon. The ribbon is from the Obchodni Academy. An internet search quickly identified it as a school in Prague. Formed around 1900, The school is open to this day, preparing students for careers in business. In reviewing the pages of the schools website, the page on the school's history indicated that the school was shut down in 1944, and the students were put to work in armament factories for the German war effort. Dachau's main output was war munitions. 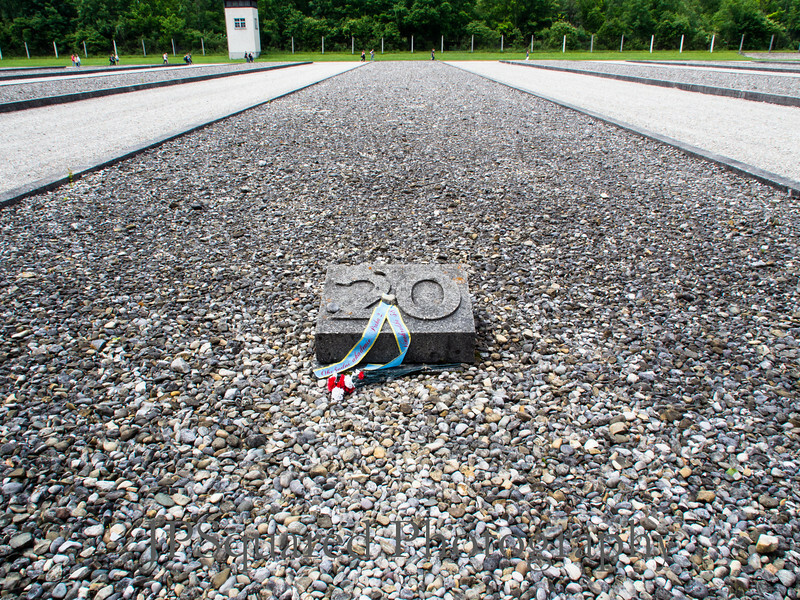 The signs and clues point to this barrack, #20, housing the students who were taken from the school and forced to work building weapons for their oppressors. Of course, it could also be the case that the school took a field trip here and the students simply left the flowers and ribbon in remembrance of the victims in general. I may do a little more research to find out. We had our two nephews who had recently graduated high school with us, and as I think about them and the students of the Obchodni Academy, I can't help but think how much talent and youth has been wasted by mankind. Its easy to get excited for a trip to someplace different and new where the geography, culture or architecture promises plentiful opportunities for great photos. Living in Indiana, we don't have the geographical features that other places have which often serve as the inspiration for great landscape images. I live in a mostly flat state marked by an abundance of cornfields. I have to travel, go to the mountains or some other such place to find subject matter for landscape photography. Or that's what I used to think. I was reviewing my twitter feed a few weeks ago and I saw the annual call go out from Jim Goldstein for his annual "Best Photos from 20XX" blog post. It led me to wonder what my year in photography was like. The more I reflected and reviewed, the more I realized it was a pretty good year. I have also come to realize that 2016 was pretty good as well, but I'll post on that in a couple weeks. No long wordy posts this week, just a portrait of Sabrina wearing a Parka.